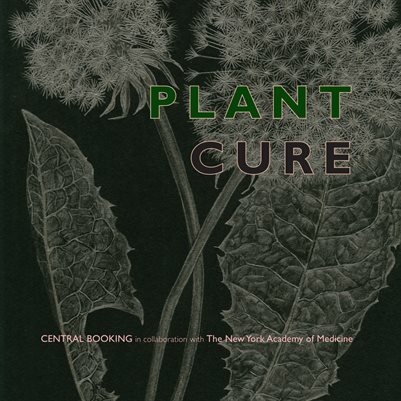 Plant Cure began as a project organized by CENTRAL BOOKING with the New York Academy of Medicine. An important component of our programming has always revolved around art and science as well as artist’s books, therefore a collaboration with the New York Academy of Medicine, containing a research library with extensive medical and science collections, seemed only natural. 5 selected artists researched at the Academy Library over six months and produced work with their own unique take on medicinal plants. The project culminated with the Plant Cure exhibition at CENTRAL BOOKING, spreading over three of its spaces in the Lower East Side gallery. It featured this work produced by the 5 Artists in Residence in dialog with other artists who have also been intrigued by the theme. While uptown, at the New York Academy of Medicine, display cases documented the research, source material, and working methods employed by each of the Artists in Residence in the process of creating their work for Plant Cure.